specific, with a definite time set for completion, there is less misunderstanding about what behaviors will be rewarded. 2 Challenge: One of the most important characteristics of goals is the level of challenge. People are often motivated by achievement, and they'll judge a goal based on the significance of the anticipated accomplishment. Rewards typically increase for more difficult goals. effective. Employees are more likely to "buy into" a goal if they feel they were part of creating that goal. The notion of participate management rests on this idea of involving employees in setting goals and making decisions. must also include feedback. 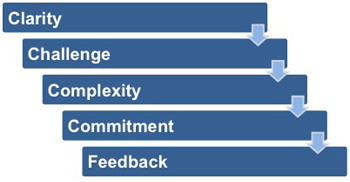 Feedback provides opportunities to clarify expectations, adjust. goal difficulty, and gain recognition. requirements for success. For goals that are highly complex, take special care to ensure that the work doesn't become too overwhelming. People who work in complicated and demanding roles probably have a high level of motivation already.